The first time I read Charlotte Bronte's novel Jane Eyre, I was captivated. The book remains one of my favorites, I've read it so many times. The story is challenging, inspiring, and a little dark. While Charlotte never mentions a green outfit in the book, the color green is a reoccurring motif associated with newness and life. These photos remind me of Jane Eyre. 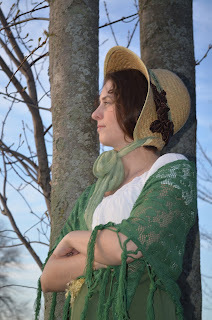 The made this bonnet from straw hat, remnant materials, and a soft filmy scarf. Each rose bud and the larger rose are hand made. 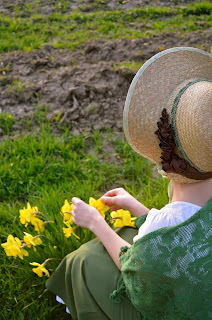 I sold this bonnet on in the Etsy Store. Well, I hope you are enjoying summer as I have been. Here in southwestern Ontario, we have had some great weather. I trust August will be another good month as well. As some of you know, Northville's annual Victorian Festival is coming soon. September 16-18 are the dates. Once again, we are planning to attend in full costume, so if you are looking for a fun way to spend the weekend of Sept 18th, come join us! We will be giving out free magnets as usual and maybe some fun book marks for the children too! And Girls, you know who you are, it's time to start costume planning! I am looking forward to your suggestions, requests, as well as looking forward to seeing your own creative designs! 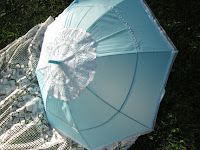 Will keep you posted with new developments, here is a sneak peak at some of the parasols that are hot off the press and waiting for display at the festival. Email me! Love to hear what you think ashtreemeadowdesigns@gmail.com.